P2link offers an e-Health disruption with its innovative and efficient telemedicine solutions, end-to-end implementation of connected solutions for telemedicine and secondary prevention services destined for chronic disease patients. This network is based on our vision of the collaborative stakeholders. P2link patients must respond to a specific profile, suffering from one or more chronic heart-related diseases or respiratory failure and have been hospitalized in recent months. 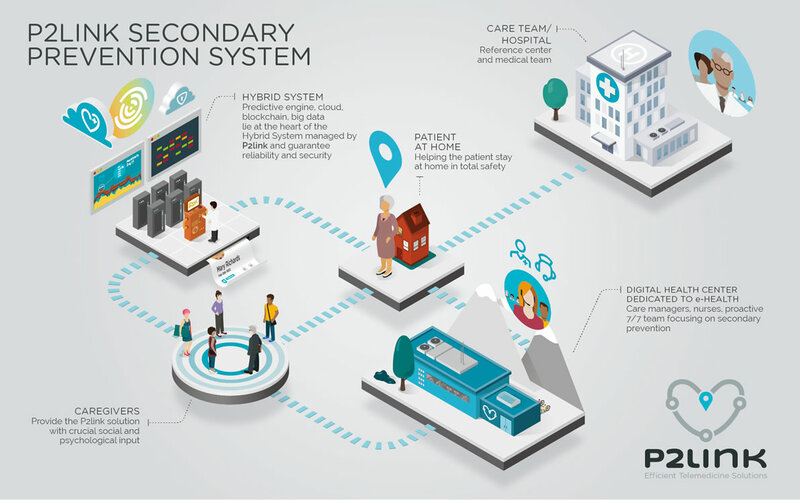 At home, patients are equipped with connected medical devices IoMT, models and specs that vary depending on the chronic disease and patient conditions. Health information is transmitted to the P2link predictive engine via a secure Internet network platform (Qualcomm) to be enhanced with blockchain technology in the near future. The involvement of caregivers will strengthen patient’s social and psychological environment. Caregivers play a key role in secondary prevention, but unfortunately they are very often disregarded or underestimated. Everyone has potential to become a caregiver. Caregivers’ profiles vary and can be adaptable to each patient’s environment and social life: a child, a family member, a friend, a grocer, a social service agent, a neighbor can be one. The most critical point is the collaboration and interaction between all those stakeholders, patients and caregivers are closely supported and motivated by P2link DHC care managers. The information collected from the field is processed accordingly and combined with indicators generated automatically to be the core of P2link solution. Operating 7 days a week, the Digital Health Center acts as the Secondary Prevention Hub of the P2link system. For each patient, all relevant information and indicators collected are analyzed and stored by the P2link innovative technological solutions. The treatment rules and personalized protocols used by nurses and care managers act in a proactive mode. They are either preventive or predictive depending upon each patient and caregiver situation. Sitting in the P2link DHC, care managers work under the supervision of nurses. The care managers have also received thorough training in the field of social work. They play a central role in patient follow-up, as they must be fully attentive to the needs of patients and caregivers.